This formerly commercial game from Wolfgang Lenerz is now available to download free from his website. It has now been enhanced to use the extended colours available in GD2 mode, with documentation available as text or Quill documents, and the source code is also available for those interested. The game is based on an old arcade game called SAME. 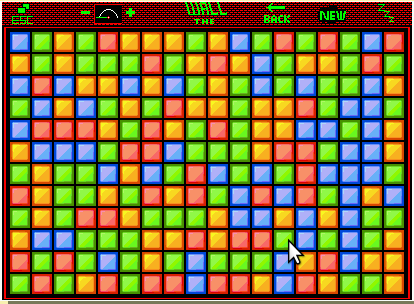 The idea is to click on a group of coloured tiles next to each other to make them disappear. There is a Back key in case you want to go back a move or two to correct a bad move or try a different strategy.The more of the wall you manage to remove, the higher your score. The game is pointer driven. This entry was posted in News on 02/04/2017 by Dilwyn.